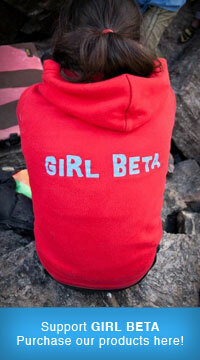 The last few posts were made possible by women from around the world who sent their climbing footage in. A big thank you to Detriot Rock Climbing Company for supplying the hang boards that these lovely ladies get to enjoy for their submissions! Remember, if you submit your video, and it is chosen, you are eligible to win a DRCC hang board, Organic Slider Pad, or some Vertical Girl Clothing, so KEEP’EM COMING!! The video submission period has been extended until May 31st. - Start with your hands on the two crimp rails at the bottom. - Use the tiny left foot and a low right heel around the arete. - Pull up to the first intermediate right crimp, then quickly throw to the higher right crimp. If you’re taller, you can just go straight to the higher right crimp. - Get a left heel on the start and lock off your right arm. Taller people can toe into the clearly marked left foot below the first starting left hand. - Fall into the left micro jug. - Bring your right hand up to the other micro jug on the right side. - Match your hands and pull up over the lip. - Reach for the far left jug and top it out. Here is a video submission by Christine Balaz. Croft Problem at the Lower Smoking Boulder (V8), Bishop, California from Christine Balaz on Vimeo. Little Cottonwood Canyon Classics – Episode 1 from Wagon Productions on Vimeo. Pull off the ground and move right hand to undercling then left hand to 1st crimp rail, left foot up near start hold. Bump left hand (big move) to 2nd crimp rail. Right foot up to point. Match hands on crimp rail. Red House Remix from Jill Sompel on Vimeo. The Beta – Begin with both hands on underclings and a left heel/toe cam, make powerful bicepy move with left hand to envelop slot. Walk right foot over to release left foot in order to move it up to the next ledge for a left toe cam. Match right hand on sloping edge. Lock off with your right arm to place left hand into finger lock. Walk right foot over and place a left heel hook above your head. Bring right hand up to pinch the undercling and bump left hand to plate. Bring right foot over and place a SOLID knee bar. Right hand comes to a wide pinch as an intermediate then bump out to a undercling pocket. Walk left foot in and flag hard with right foot, bring left hand to next good pocket jug. Match on jug and move up with left hand to small crimper on face. Bring right hand to sharp slot, re-adjust feet and go big to the sloping edge with left hand. Step feet up on jugs and traverse over right with good underclings at your waist! Katha Saurwein doing ‘Xavier’s roof’ V11 the girls way. Bishop CA from katharina saurwein on Vimeo. Sierra Allen presents us with another video from Utah and Nevada. In this one she climbs Porcini or Portabello V6, Brawny Dyno V5, Michelangelo V3, Mr. Smiley V7, and the Pearl V4/5. Select Boulder Problems from Joe’s Valley, LCC, and the Kraft Boulders from Sierra Allen on Vimeo. Kerstin bouldering Carrot Top at the Happy Boulders, Bishop from Ralf Reines on Vimeo. Here is a neat little video of Kerstin bouldering T-Rex V3, in the beautiful Yosemite Valley. Kerstin bouldering T-Rex Yosemite Valley from Ralf Reines on Vimeo. You are currently browsing the archives for the Boulder Problems category.